Digital storytelling provides students with a powerful learning experience that capitalizes on their interest in technology and their skills with it. Because they are creating as well as consuming media as they develop stories, the process of researching and creating a digital story provides an authentic opportunity to practice essential literacy skills in areas of reading, writing, speaking, and listening. The Common Core State Standards for English Language Arts state, “The need to conduct research and to produce and consume media is embedded into every aspect of today’s curriculum” so students develop the ability to “analyze and create a high volume and extensive range of print and nonprint texts in media forms old and new.” Digital storytelling gives students these opportunities while making deep connections to content. While the technical aspect of digital storytelling may be the “hook” for students, technology is secondary for student learning during the process of developing a digital story. Effective digital stories combine extensive research, ideation, critical thinking, organizing, writing, editing, and media literacy. Digital storytelling provides a compelling need to read and listen carefully and to write and edit effectively. When reading informational text, students often overlook the author’s perspective on an issue. A great digital story doesn’t just share facts about something, but shares information through a story from a specific narrator. Digital storytelling requires students to research a topic and read information with an eye to author’s perspective, helping them learn to carefully analyze informational text for point of view. While students may be able to quickly locate information online, they will need guidance in digging deeper to find high-quality information. Primary sources generally have a name attached to the creator, but you will want to include instruction on how to evaluate the quality of secondary sources. Who is the author of the information? How many other authors are cited as research to support the information? Students also need instruction and coaching on how to analyze and use the information they find. The use of graphic organizers during the research and organization process helps students evaluate and organizer the information they are gathering. As students become more savvy using organizers, discuss how to choose an organizer most appropriate for the content and ideas. While digital storytelling implies a focus on technology, a powerful digital story cannot exist without powerful writing. While students will be reading, researching, and even creating soundtracks, the heart of a powerful digital story is a well-written script. Digital stories are concise moments in time, usually consisting of approximately 300 words. When students are trying to tell a story from their research, 300 words won’t initially be enough. They may start with 500-1000 words and then work down to make the story more concise, focusing on precise language for powerful communication. The editing and redacting process helps them dig to the heart of the issue they are exploring. As you begin to incorporate this process in your classroom, you may want to utilize how-to videos. Most students have used YouTube videos to learn more about something they find compelling whether it is creating rubber band bracelets or learning the latest soccer move. Students may have also encountered how-to videos in flipped classroom environments. Student’s familiarity with this format means you have to teach them less about the process and more about the criteria makes them effective. Digital storytelling also provides students with authentic opportunities to write in all three forms mentioned in the Common Core State Standards (Appendix A): argument, informational/explanatory, and narrative. The best digital storytelling projects often combine these forms of writing for powerful effect. Many PSAs include argument and persuasive elements to change the behavior of the viewer. Students can funnel their passion about issues into informative PSAs to raise awareness and educate others about an issue. When creating documentaries, students often make the mistake of simply summarizing facts instead of telling stories that will engage viewers. To avoid this, encourage students to share the information as a docudrama or dramatization of events from a specific character’s perspective. In today’s digital world, research materials come in many forms. Students will, of course, read many texts, but they may also be listening carefully to music for lyrics, intonation, and mood. They may also be listening to interviews and other oral forms of storytelling or even conducting their own. As they listen to this information, especially content from primary sources or interviews, they need to become critical listeners to better evaluate point of view and personal perspectives. As students are work to get the narration just right, they don’t often notice they are reading and practicing fluency. Effective digital storytellers don’t “wing it;” they write scripts, read, reread, edit, and practice, practice, practice. They work on intonation, using grammar cues to help with cadence and flow. If your students aren’t strong readers or confident speakers, or if they are new to the English language, creating a digital story provides an authentic reason to practice fluency. To provide a non-threatening environment for this practice, use headset microphones. This allows them to record, listen, and rerecord until they are comfortable with their fluency and ready to include their speech within their digital story. The plethora of options for images and soundtracks can lead to stories with a lot of flash and not much depth. Educators can structure the process and provide feedback to help students build essential digital age communication skills. For example, many teachers require a script to be written and even a storyboard and pitch to be given before work on the computer can begin. As with any skill, students will grow into their ability to “take advantage of, rather than suffer from, the visually stunning effects today’s tools provide.” As students work to combine a compelling narrative with powerful imagery and a meaningful soundtrack, they become increasingly savvy about the media they are creating. It takes practice to become effective communicators, regardless of the medium. The creation process also turns them into more astute media consumers. As they add pans and zooms to their stories to focus the viewer’s attention, they start to see these same techniques being used on them in the commercials and movies they watch. 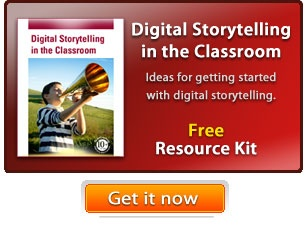 Digital storytelling provides a wealth of opportunities to engage students in content learning in your classroom. No matter what content they explore, the process of research, writing, creating, and editing a digital story builds essential 21st century literacy skills.